[Episcopal News Service] The door of the downtown storefront in this central Wisconsin college town opened into a spacious retreat, a warm gathering place with couches, chairs and tables, and one that, every Saturday, offers a modest breakfast. On this Saturday, a man in a red hooded sweatshirt was the first through the front door promptly at 9 a.m. 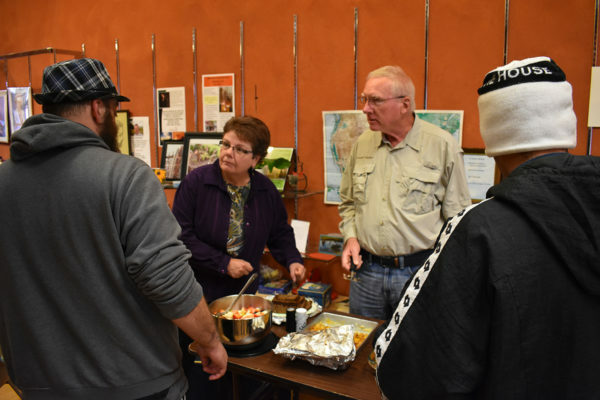 He made his way first to the coffee, only later wandering over to the Episcopalian and Lutheran volunteers who were serving ham, cheesy potatoes, banana bread and other homemade items. Another man in stocking hat and coat plopped down on a chair looking weary. “More sick than hungry,” the man said. The Rev. Jane Johnson pulled up her own chair close to sit and talk with him as the rest of the room began to fill with conversation over food. 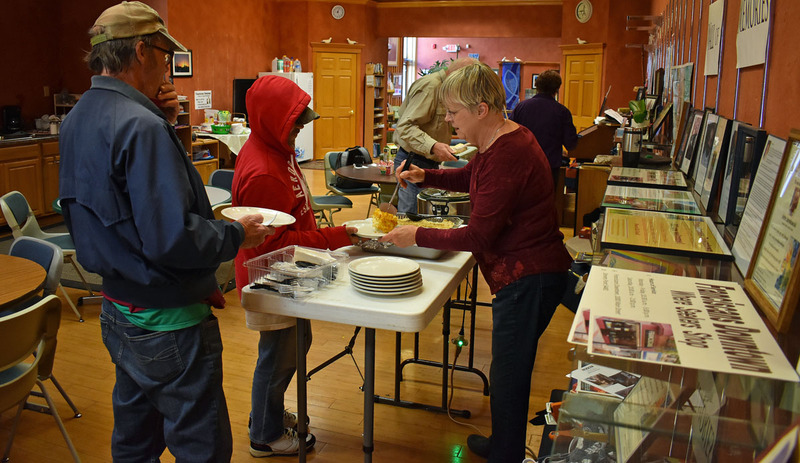 This weekly community meal for people who are chronically homeless or living on the economic margins is one component of a ministry known as Extending the Table, which has received key support from a $20,000 Mission Enterprise Zone grant from the Episcopal Church. Meals are central to the ministry but only as a means to the underlying goal of building new relationships. “And those who just need a friend,” fellow volunteer Diane Rice said as she prepared to serve food to about a dozen or more people. The ministry is ecumenical because the congregation itself is ecumenical. Johnson is rector of Intercession Episcopal Church and pastor of Redeemer Lutheran Church through a partnership they call Beloved Community, involving a shared worship space in Stevens Point, a small city of about 27,000 people. They also collaborate on the Mission Action Team spearheading Extending the Table, which is taking church into the community in innovative ways. “The challenge that we decided we have is, we don’t know how to build connections with people who are not like us,” Johnson said. The four groups that Extending the Table aims to connect with are people living on the economic margins, the transgender community, college students and young people. Even before those efforts received the backing of an Episcopal Church grant, Intercession had reached out to the transgender community through a support group called Just As I Am, led by Intercession member Bobbie Joy Amann. Amann, who now serves as the lead missioner of the Mission Action Team, is transgender and knew some of the therapists in Stevens Point who work with the transgender community, so she began spreading the word about creating a church-based group offering support and socializing. The LGBTQ community “in the past has been very, very suspicious of Christianity, at least the way it has been misrepresented,” Amann said, so it was important to first build trust and not go in with a religious agenda. The church began hosting the meetings about two years ago, sometimes drawing 15 to 20 people. Amann thinks the participants were impressed by congregation members’ willingness to listen with acceptance and offer silent witnesses to their experiences. Members of the Just As I Am group still meet socially around town and remain connected to the church, though the regular church meetings have since ended. 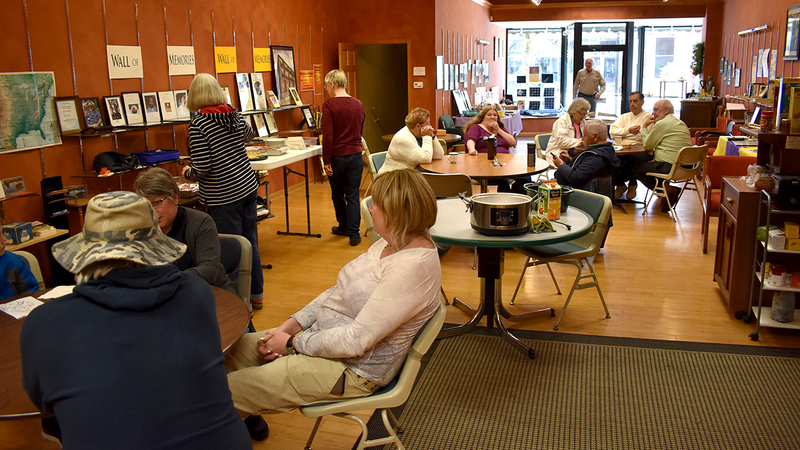 Extending the Table also has organized monthly community dinners at the church for the Gender and Sexuality Resource Center at the University of Stevens Point, which helps the church build relationships with both the LGBTQ community and college students. The most recent dinner was May 10 and featured pizza and conversation and “just being present to them in a way they’re probably not used to having Christians be with them,” Amann said. That is the approach the Mission Action Team is taking with all the communities that are part of Extending the Table. “It’s putting wings to our gospel and being the hands and arms and feet of Christ,” Amann said. The efforts underway at Intercession coincide with an openness to ministry experimentation and reflection encouraged by Diocese of Fond du Lac Bishop Matthew Gunter, who created the diocesan Commission on Congregational Vitality about three years ago. The commission, of which Johnson is a member, is working with all congregations in the diocese to assess their strengths and challenges and develop plans for making them more visible in the community. And those plans are not intended to simply get more people into the church on Sunday. “We’ve been encouraging congregations to think hard about what they can do in their own context,” Gunter told ENS. Extending the Table has been a leading example. “The way they did that fit very much into the mindset of what can we do to engage mission differently,” he said. One catalyst for the Extending the Table was the deliberations over Intercession’s building. It was in serious need of repair, and although fixing the building to remain in the congregation’s historic location would have been feasible, the members began discerning whether that was really how God was calling them to use their time and money. Cathy Cowling, another member of the Commission on Congregational Vitality, was asked to help facilitate those discussions, and she told ENS that Intercession didn’t make the decision to move lightly. “Is the church the building, or is the church the people gathered there and doing ministry? And they said the church is more than the building,” Cowling said. Intersession already had a growing relationship with Redeemer Lutheran Church, an Evangelical Lutheran Church of America congregation. Johnson had been leading a regular Wednesday night meal and Christian education session involving members of the two congregations. With Intercession assessing its location options and with Redeemer searching for a new pastor, the two churches reached an agreement to share Johnson as rector-pastor and to allow Intercession to move into and share Redeemer’s church building starting last August. The Saturday breakfasts grew out of an earlier ministry to homeless people staying in a winter warming center housed in Intercession’s parish hall and run by an organization called Evergreen Community Initiatives. That warming center, with a capacity of a dozen people, opened in November 2016. The church started offering meals to the warming center residents some Saturdays, and when the warming center closed for the season in April 2017, Intercession decided to continue the meals every Saturday morning at a centrally located park in Stevens Point. 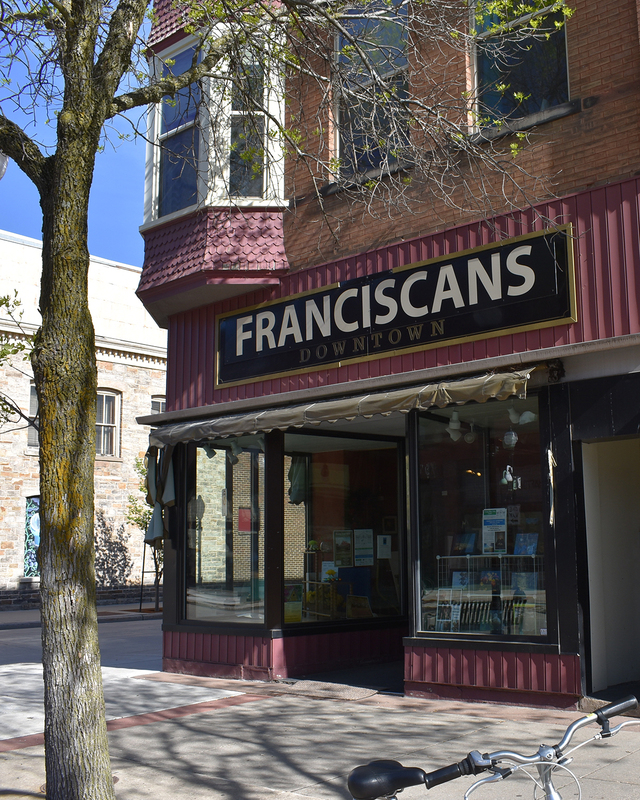 Then last fall, the breakfasts moved to the current location in Franciscan Downtown, a kind of day center for the homeless and economically disadvantaged run by a Franciscan order. “How is Mother Jane?” a man named Jeffrey said to Johnson shortly after arriving at breakfast. Jeffrey is a Saturday morning regular and a former resident of the warming center at Intercession. “I’m well, thank you,” Johnson said. Most of the people who come are chronically homeless or people dependent on government assistance to get by. Jeffrey, who declined to provide his last name to a reporter, is 67 and gets by on Social Security checks and selling items at flea markets in the summer months, when he lives out of his car. He and the others who gather here Saturday mornings can take advantage of well-established feeding services provided by other organizations in Stevens Point. The goal of Extending the Table was not to replicate those organizations’ work. The Mission Action Team follows an open-ended but deliberate cycle: Listen, discern, experiment, reflect, repeat. It’s a template that can be followed by congregations across the church. 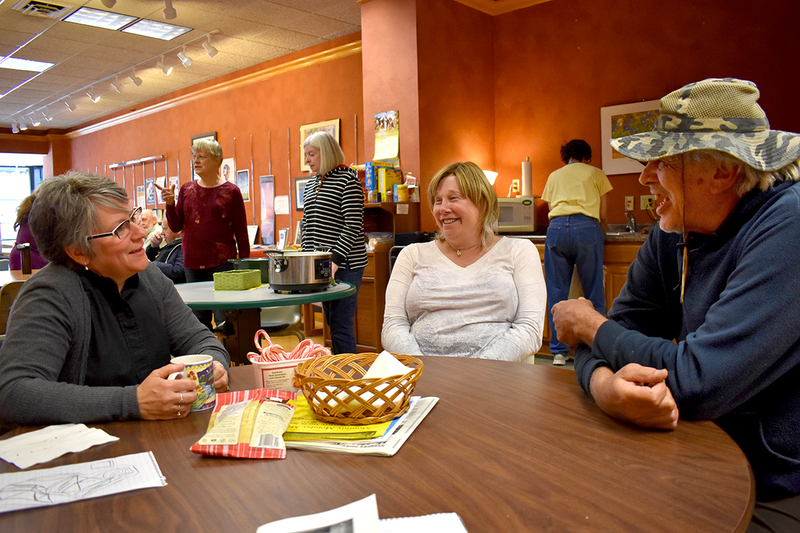 God’s presence is felt every Saturday at Franciscans Downtown, where on this morning the meal was followed by a memorial service for John Jankowski, a beloved regular who died the month before. “The best way to describe John was, we all have our own idiosyncrasies, tendencies and peculiarities, and his peculiarities were peculiar,” Jeffrey said. As for Jeffrey, he said he once taught math and economics to high school students. Now he likes to spend his summers in Wisconsin’s Northwoods, or wherever else life takes him. He said he has no family, though it was clear he had made connections among the people at the breakfast.